Terri Kelly Moyers’ demeanor is as refined and ladylike as the cowgirls she paints, and her personality shines through her work like afternoon sunshine gently streaming through lacy cottage curtains. I’m originally from Calgary, Alberta, Canada. As a young girl growing up there, I spent many hours riding horses, and I was surrounded by wildlife, cowboys, and Western scenery. Affection for the West very much influenced my future in art. I cannot remember wanting to be anything but an artist, and I later attended the Alberta College of Art. I married a fellow artist, John Moyers. 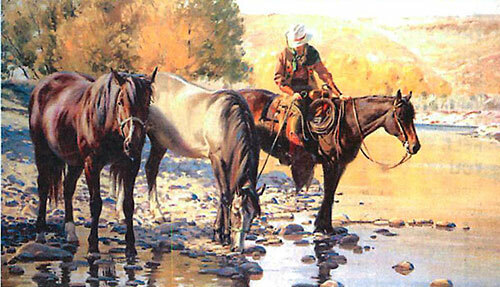 John also paints the West. We now live in Santa Fe, New Mexico. We have one son, Joshua, who wants to be a filmmaker. 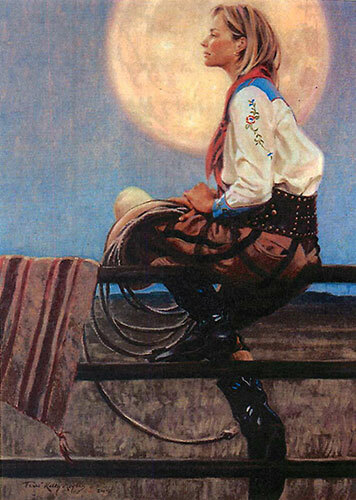 YOU’RE KNOWN FAR AND WIDE FOR YOUR COWGIRL PAINTINGS. WHAT SUBJECTS HAVE YOU BEEN WORKING ON LATELY? Well, in 2010, we traveled to Spain. John and I love to travel, and we paint wherever we go. Since then, I’ve been painting Spanish ladies—their clothing and accessories are rich in texture and detail. One painting is aptly entitled “Her Finery. Next on our traveling paint- as-we-go agenda is a trip to England and Italy. WITH A BUSY SCHEDULE THAT INCLUDES ART SHOWS AND GALLERY APPEARANCES, DO YOU HAVE TIME FOR HOBBIES? I used to garden, but we’re on the go too much now. We have two Chihuahuas, Peso and Poquito. John and I love to go fly-fishing. I also read quite a bit. Traveling, for us, is a working vacation. When you love your work, your life and your occupation are woven together like a tapestry. SANTA FE IS KNOWN FOR BEING A “MECCA” FOR ARTISTS. WHY IS THAT? I’VE ALWAYS WONDERED. The light. The sunlight of Santa Fe is amazing, and perfect for painting. 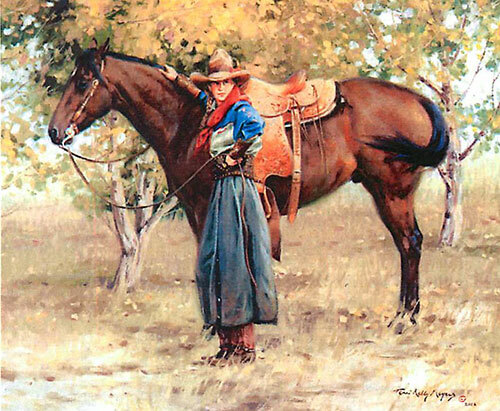 TERRI, YOUR COWGIRL PAINTINGS BEAUTIFULLY ILLUSTRATE A “FARMGIRL” ATTITUDE. I THINK THEY EXUDE THEIR CREATOR’S GRACIOUS CONFIDENCE AND SPARKLING SENSE OF SELF. YOU LOVE WHAT YOU DO, DON’T YOU?